It seems like just the other day that one read the news that Peter–Csizmadia-Honigh, a Hungarian living in London and then working for the Institute of Masters of Wine, had won the 2014 Geoffrey Roberts Award. He was selected out of applications from 11 countries. 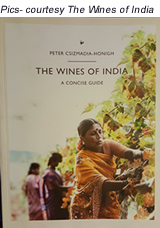 The Award of £4,000 in June 2014 was to help him publish the ‘first-ever book’ on Indian wines. He must have gone into the project instantly to have completed and launched the book in October this year. The 454-page paper-back in the unusual size of 25cm*19 cm (10in*7.5 in) distinguishes it from many other books on the subject and makes you focus. The art paper, printing, pictures, and the general feel gives nice ‘aromas’ to the reader. 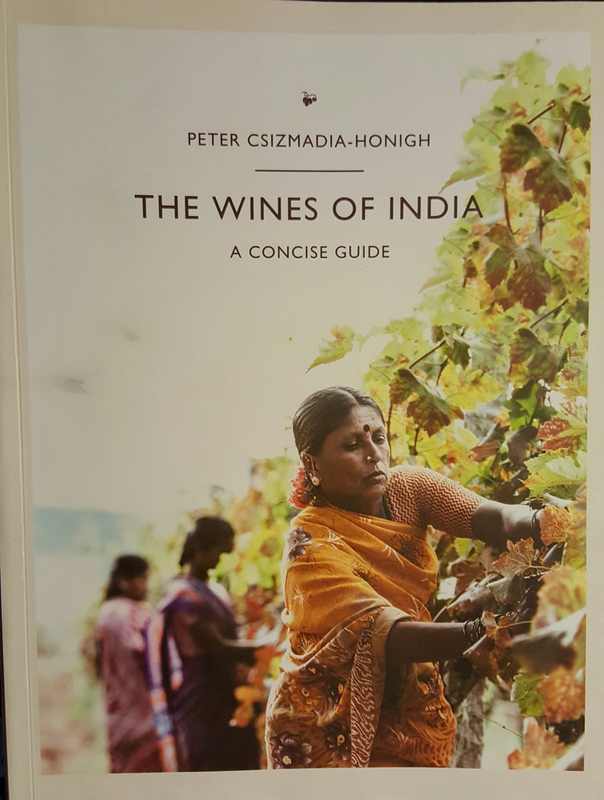 The ‘flavour’ of the technically well-written book has an abundance of maps, history of Indian wines during the last 30 years, story of each of the 50 wineries and the Estate, Peter’s Picks and Labels among many other positive aspects. Maps- are an essential part of any published material to understand a wine region and many books have the basic shortcoming of not including them, assuming the reader knows it already. When I visit a new winery or region in India or overseas, I like to familiarise myself with the country (if new), wine regions and then the specific location of each winery as a first step. 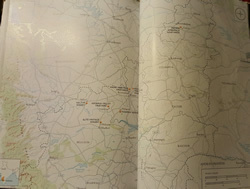 It is for the first time that a wine publishing has focused on these maps, making comprehension a lot easier. For instance, the map on 314-15 of North Karnataka, adjoining South Maharashtra tells an interesting story of the Indian wine industry to a discerning eye. 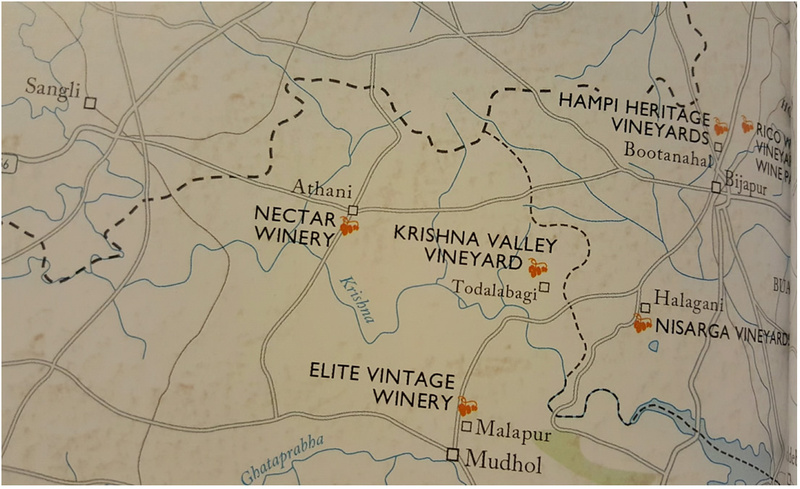 The map shows seven wineries on the periphery-six around Bijapur (Nectar, Krishna Valley, Elite, Nisarga, Hampi Heritage, Rico Valley ) and one (Indian Ambiance) near Bidar in the North East Karnataka. Their proximity to Maharashtra gives away the story; they came up so that the wineries in Maharashtra (like Sula, Fratelli) could get the wines made there to sell in Karnataka market without paying the import duties imposed on out-of-state-wines by Karnataka as a counter to the Maharashtra Policy of 2001. Format- Information about each winery is presented in a template - The Fact, The Story, The Estate, The Wines, The Labels and Peter’s Picks, making it easier to read and even compare, making it a useful reference book. The Facts give the basic numbers and details of each winery. The Story tells you about the background whereas the Estate gives details of winemaking, viticulture, styles etc. One can get the whole information needed to understand the heart and soul of any winery in The Estate section. The Wines section describes the wines, grapes, style and their positioning in the market. The Labels section describes briefly the various labels produced by the wineries. The various Brands outsourced for production get the benefit of their Labels being a part and parcel of the Guide as well. Peter’s Picks- are his personal choices of wines that vary from 0-5 in number. If your label is not in the list-you ain’t arrived yet, according to him. There is no hard and fast rule-it’s based on his judgement which is primarily based on criteria defined in the book –thus awarding scores out of 20. This section is also a primer on the probability of extinction of a winery unless changes are made. But what is most useful is a list of Highly Recommended Wines on pages 97-102. Those of you who might not be aware that India makes decent wines would be surprised to see 145 wines scoring over 16/20 points. Although only 2 wines score as ‘Outstanding’ (19+), there are 10 Excellent wines (18-18.9 points) and 27 Very Good Wines (17-17.9). There may be some disagreements because of individual perceptions but in general, he has been very objective and the results are indicative of a decent option for the consumer as well as an overseas importer. There is even a Classification of the Wineries by stars with 2 of them being in the top 5-star category, followed by 12 wineries in the 4-star category and these would be the focus for domestic consumers as well as the importers or potential importers of Indian wines in the near future. The book has an almost Complete Coverage of all wineries in any corner of India- more specifically in Madhya Pradesh and Tamil Nadu. This has been independent coverage despite the size and the present condition of the winery so long as it was apparently functional at the time of his visit. So Indage and Vinsura are missing in the list. Up-to-date information-Peter has been incisive, precise and microscopic in including the latest information and in this respect has been quite current. For instance, Big Banyan has been quietly working on setting up a winery on a 6-Acre farm near Bangalore. I believe their Italian winemaker Lucio Matricardi is visiting Bangalore in the first week of January to assess the status; Peter has reported about the winery. He has also acknowledged the unfortunate death (due to a flying mishap) of Ramesh Rao, the amateur flyer owner of Mandla Valley Wines in May 2015. There are a few minor shortcomings which are perhaps due to the constraints or his choice of including or not including them- the biggest one being that no indicative prices are given for the wines. Classifications and sub-classifications are indicated but whether it is a Barrique fermented wine or a wine made from local eating varieties like Bangalore Purple or Bangalore Blue, they are all lumped together. He could have chosen the ‘Rupee’ symbol and given five Rupee gradings from cheap to very expensive, covering the whole spectrum of under Rs. 200 (including ‘Ports’, fermented and other cheap entries) as 1 to Rs. 1500+ wines as 5 (in Rupee symbols). He has chosen not to talk about closures (a revolution has been taking place in India) and packaging- nor has he published any labels-an important aspect of describing the wines. Bombay Dreamz (Indus), Ch d’Ori, Turning Point (Trinity Vintners) are but a few of the labels that are innovative, attractive and would win medals in any international competitions for packaging or as wine labels. Many pictures in the book are not relevant to the Indian reader-equally a less number would not see a direct or indirect interest for overseas readers. The space so released could have been given the bottle images. Many pages have even been left totally blank perhaps to make notes. Space constraint cannot be a valid reason. Taking the example of a vineyard where one can have 7000 plants/ hA or 3000/ hA, the book has the equivalent of 2500 hA. A lot of space has been left blank, used to give it the wide expanse look. This may be fine to an extent as it makes it easy to read. But beyond a point it appears as a waste of ‘expensive real-estate’. I suppose he is the artist and decides how to use the canvas. No Contact Details are provided. ‘Anyone can Google them’, could be a possible reason but if someone wants to get further details he should be able to pick up the phone and call the right person or have his email address. General emails are often ignored by the wineries and the management does not respond to queries since they are not even aware of them-this has been a common complaint of several potential importers. A Guide should include the basic information. Production figures are the most suspect. Many figures seem to be merely the capacity given by the producers and are not the actual production figures for say 2014-15 which should be normally the case since it is an up-to-date account. If one added up the Production indicated, it would be more than twice the actual figure. Soma (Nashik) for instance claims a production of 70,000 liters (8000 cases) which seems to be on the very high side. With 20 tanks of 1000-7,500 liter capacity it seems to be the capacity. Pachpatil claims to have made 5,000 cases but has not indicated how he is going to scale it up to 50,000 cases. He may claim to follow the Sula method and go for bulk wine purchase followed by bottling. But to expect a sale of 50,000 cases or even 5,000 cases from the cellar door seems to be a very ambitious target. Renaissance winery claims to produce 700,000 liters (80,000 cases)! Alpine makes 750,000 liters (83,000 cases), Four seasons (1,500,000 l= 163,000 cases)! Where was all this wine sold or exported? Sula and GroverZ seem to be in the ball park- though slightly on the higher side; else they are operating close to their capacity? It would have also been useful to include the Export figures of (2014-15) for each producer-even though the number of such producers is less than 10. Perhaps the listing of countries exported to, might have been interesting. Surely, the readers might like to know the exports to China, Japan and the USA or other interesting regions-there are a lot of dark horses and this section would reflect on the increasing acceptance of Indian wines even though it might be exported as a niche product. Of course the top exporters would indicate the total number of countries of export and indicate their top 5 markets. 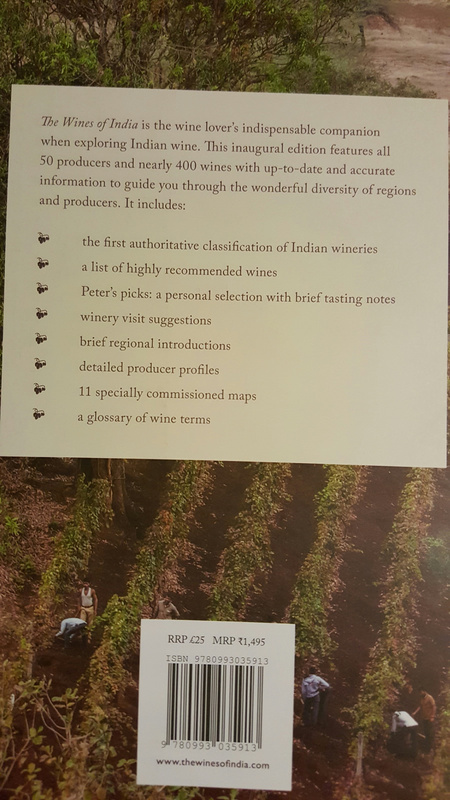 Non inclusion of Fortified wine producers – Peter does not seem to have paid much attention to the fortified industry/Goan ‘port' though he has included a few wineries like Heritage and Tonia. There is a market of over 1.2 to 1.4 million cases of these wines. Big Banyan sells over 300,000 cases of Goana (the only distillery in India which heeded my plea for the last 5 years and changed its label from Port to Fortified wine years ago), Tonia (over 100,000 cases), Hampy Heritage (around 130,000 cases), and Golconda (over 80,000 cases) in Karnataka. Goa-based Vinicola is totally missing-it used to sell over 120,000 cases a year but one has not heard of what has happened to it after a major tragedy in the family. At a personal level I would have liked to know what happened to the winery in Pondicherry which used to bottle wines from Indage Vintners for the South Indian market before the company went bust. Apparently, non fortified wines from Sula, Zampa and Fratelli have been included in the figures since Maharashtra has a distinctively negative and prohibitive excise policy for fortification of wines and has reined in the producers to keep to low cost-low quality wine made from indigenous grapes-same is not the case in Karnataka, Goa etc. Similarly missing is Vinsura (as mentioned earlier) which is one of the oldest wineries in Vinchur Park, Nashik since 2003 but is currently closed due to management/financial trouble. Same is the case with Flamingo that earlier supplied wine to Indage and is now reportedly a satellite winery that supplies bulk wine to Sula, some of whose other supply partners have been included. Same has been the case with Pimpane which is now being operated by Sula but has had a colourful past in the 1990s. There are several interesting facts like the Nira Valley winery ‘being managed by three science teetotaller women graduates with wines that are dried out fruits and dusty tannins, old and at times oxidised-well below sub-entry level’. Or that they in fact were originally ‘producers of Luca and Kamasutra labels’ for the now defunct Nirvana BioSys in Haryana. To know more about the horror and/or amusing stories, you need to buy the book! Overall, it is an excellent book to get a grasp of the Indian industry and Peter has done a thorough job of getting the picture right. It could be used as an authentic Guide by a wide cross-section of the people, including those who are WSET-2 or 3 or Diploma-qualified or students (curriculum must include Indian wines if WSET has to be really meaningful for Indians or wine specialists overseas) and if the IMW could be convinced to use this as an authentic book for the MW theory exams and include Indian wines, it would be a great initiative in bringing Indian wines to the fore.